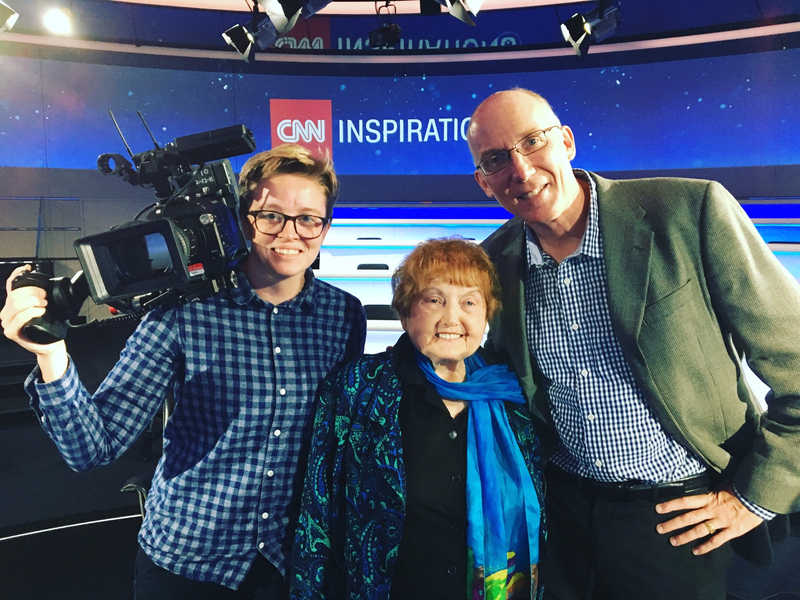 Ted Green, Eva Mozes Kor, and Mika Brown visited a CNN International set in London in 2016. Photo courtesy of Ted Green Films. This spring, “Eva A-7063,” a documentary about Holocaust survivor Eva Mozes Kor, will premiere at Clowes Hall. Kor and her twin sister were victims of experiments under the direction of Nazi doctor Josef Mengele. Decades later, she gained global recognition for her controversial decision to publicly forgive the Nazis in an act of self liberation. Kor, who is 83 years old and now lives in Terre Haute, Indiana, has spent years traveling and inspiring audiences with her story. She also established her own Holocaust museum and educational center in Terre Haute, called CANDLES. Recently, she gained attention for an interview with Buzzfeed that went viral, gathering more than 185 million views. In the interview, she speaks about the torture she endured as a child, including receiving frequent injections that made her sicker and sicker until the Nazi doctors told her she had only two weeks to live. She also speaks about her eventual journey toward public forgiveness 50 years later. Now her story is being told again, but in its entirety. “Eva A-7063,” created by Ted Green, Mika Brown and WFYI Public Media in Indianapolis, premiers on April 5. It takes an in-depth look at Kor’s life, including some pieces that are commonly left out. Green said that Kor’s story is often told in two parts: part one and part three, as he calls them. Part one is her experience in Auschwitz as a child, and part three is her decision to forgive the doctors who abused her. He decided to do it differently. Green said the idea for the documentary originated unexpectedly, after a friend encouraged him to go see Kor speak at an event in Clowes Hall. After seeing her speak, he reached out to her about the idea of making a film. Kor suggested Green accompany her on a trip to Auschwitz to experience the full magnitude of her story. He went, along with co-producer Mika Brown, and immediately knew he wanted to make the documentary. In addition to documenting their travels and telling Kor’s story, they also included on-screen appearances in the documentary by Wolf Blitzer of CNN, actor Elliot Gould, and basketball player Ray Allen. The film is narrated by actor Ed Asner. Green says they also researched extensively the theme of forgiveness for the documentary, which is a famous and central part of Kor’s story. “We look at it from a lot of different angles: different religious angles, we speak to top Holocaust experts in the world, we talk to forgiveness experts, we talk to survivors, fellow survivors who disagree with her vehemently, and to legions of people who have their lives changed, some would say saved, by her,” Green said. And while Kor’s journey is one of eventual self liberation and forgiveness, Green said the documentary is not a feel-good story. Kor’s decision to forgive the Nazis was very controversial, and she herself extends beyond the innocent image that people might expect from a four-foot-nine 83 year old. John Cornell, a history professor here at Butler, said the contrast between Kor’s forgiveness and the vigilance of other survivors really shows how differently people’s responses to human calamity can be. He said that while Kor’s response of forgiveness “operates in a personal sphere, vigilance operates in a political one.” There is continued uncertainty and discussion about which response to emphasize. Green said he took a very objective stance when making the film, including some conflicting perspectives such as these, and some aspects of the film that Kor may not necessarily love. All that aside, he maintains that her story is one of healing and love, and that working with her has changed him. “I personally had my life changed by this woman and I very much wish that I had met her much earlier in my life,” Green said. Tickets for the film’s premiere can be purchased at the Clowes Hall box office or at the Butler Arts Center website.